Alexis Sanchez’s goal drought has continued for Manchester United with another poor performance and fans are really losing patience with the Chile international. It’s just not happened for Sanchez in a United shirt since his keenly-anticipated January transfer from Arsenal, and it’s hard to see where the improvement is going to come from him. 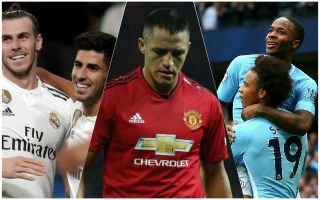 When the South American first struggled at Old Trafford, it could quite easily be blamed on the fact that he was joining midway through the season and was struggling to settle alongside his new team-mates so quickly. However, having had the summer off to rest and to enjoy a proper pre-season with the Red Devils, it’s a big worry that Sanchez still looks completely lost on the pitch. Set to turn 30 at the end of this year, Sanchez is hardly going to be making a big improvement any time soon – in fact there may be a case for saying he’s now past his peak after so many tireless performances for club and country during his long and successful career. Despite his shock decision to stay at Atletico Madrid this summer, it might be worth United paying whatever it takes to land Antoine Griezmann. The France international is a world class performer and has done the business in the big games and big competitions for a number of years now. Diario Gol recently suggested Griezmann may be regretting not leaving Madrid this summer, listing United as one of the clubs on alert, so perhaps there’s a chance this could amount to something. Gareth Bale transfer to Manchester United to replace Alexis Sanchez? Perhaps not as likely any more, but Gareth Bale would be ideal for this United side, bringing more pace and directness to the team. That seems to be what this club is missing right now with so many similar players vying for spots in attacking midfield – namely three right-footed players who cut in from the left in the form of Sanchez, Anthony Martial and Marcus Rashford. Bale could provide more natural width if used out there, and has shown what he can do at Premier League level after great success at Tottenham earlier in his career. This could be a bit ambitious, but Chelsea should also be getting worried pretty soon as Eden Hazard is yet to sign a new contract with the club. The Belgium international is one of the best attacking midfielders in the world and would certainly not be short of offers if this saga continues, with United one of the teams who should definitely look at him as a possible upgrade on Sanchez. Hazard’s current deal expires in 2020, meaning Chelsea would surely be forced to accept a cut-price deal for him soon in the way that they did with Thibaut Courtois this summer. According to the Times, he’s stalling on signing a new contract until the Blues’ Champions League status is assured, so United should definitely be keeping an eye on this one. Is it time for Man Utd to consider selling Alexis Sanchez?